Now in its fifth year, the Recovery Shield in Gateshead welcomed Fulfilling Lives FC to the pitch. The team finished 3rd in the tournament (podium position!) out of a total of 13 teams. 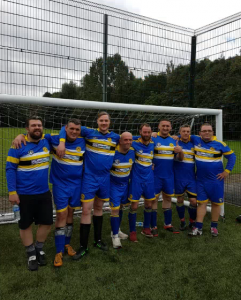 The Recovery Shield was held on 27th September 2016 at Redheugh Boy’s Football Club in Gateshead, and was organised by a staff member of Changing Lives: David McCormack. With this being it’s 5th year it was decided to make it for teams from socially excluded backgrounds, so 13 teams from Leeds, Middlesbrough, Durham, Gateshead, Newcastle and Edinburgh from a variety of backgrounds including mental health, addictions, homeless and suicide prevention all came together to celebrate recovery and new beginnings. The idea of having a Recovery Shield in the region was first set up by our very own Richy Cunningham (System Broker), 5 years ago whilst working at Turning Point. Over the past few years, North East Athletic (NEA) have organised the event. The overall winners of the tournament were Middlesbrough. Well done to all involved!